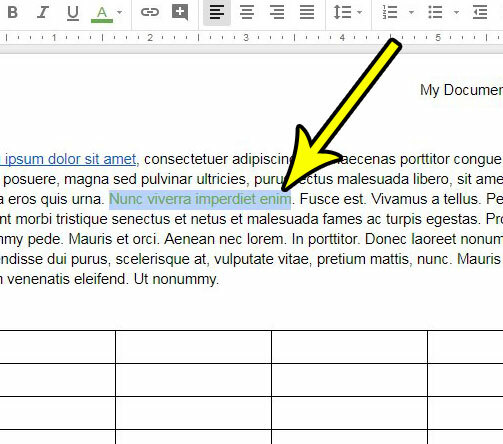 Text that you type into a document in Google Docs will typically have a black font color. This is the default setting for new documents, and is often the standard when creating documents for school or work. But some of the text that you copy and paste from other sorts may have a different color. This is especially common when you copy and paste text from a Web page. Even if the color difference is only a minor variation, such as a dark shade of grey, it can be noticeable. This can leaving you looking for a way to change the color of that font and avoid manually retyping everything. Our tutorial below will show you how to select text in Google Docs and change the font color of that selection. 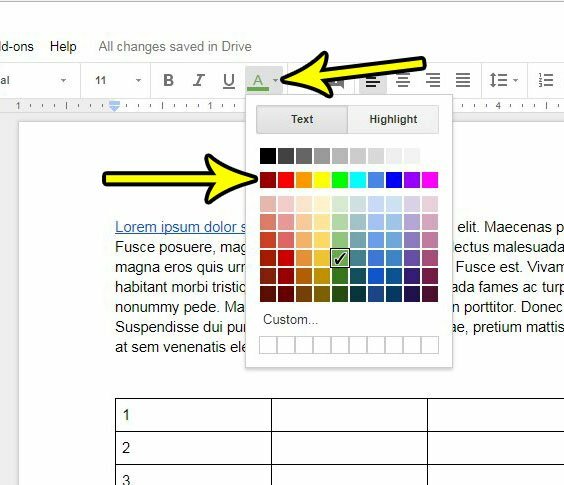 The steps in this article assume that you currently have a selection in a Google Docs document that is a different color than you would like. Following these steps will show you how to select that text and set the font color to a different option. Step 1: Sign into your Google Drive and open the document containing the text for which you want to change the color. Step 2: Select the text that is the wrong color. If the entire document is the wrong color, you can click somewhere inside the document of the body and press Ctrl + A on your keyboard to select everything. Step 3: Click the arrow to the right of the Text color option in the toolbar, then select the desired color. If there are multiple formatting options applied to a particular selection and you would like to remove all of them, then find out about clearing formatting from a selection in Google Docs and save yourself the trouble of going through and finding each individual formatting option.